Navigating the landlord-tenant relationship can be tricky at times, but landlords and renters don’t have to perpetually be at odds. During part 1 of this article, we touched on 5 ways to keep your landlord happy. 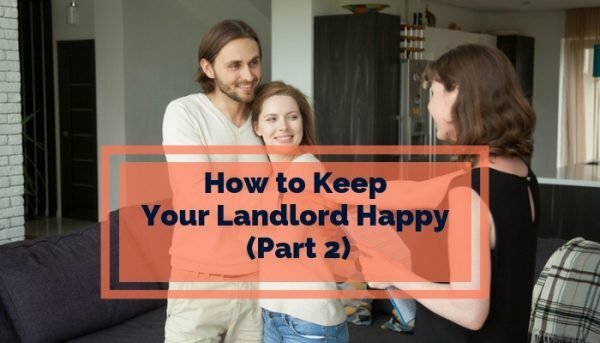 As we’ve discovered, in How To Keep Your Landlord Happy (Part 1) the unfortunate reality is, that most renters are unknowingly damaging their landlord’s perception of renters without even realizing it. Having a good history with your landlord is vital to ensuring that your landlord will be more willing to assist you if you come across a rare late payment or simply need a good reference for a future rental. This time, we will talk about the last 5 ways to become an excellent renter and develop a great landlord-tenant relationship. It’s true that your landlord is responsible for most maintenance issues, but if you want a truly happy landlord or property manager be sure to tend to your renter maintenance responsibilities. Ensure your landlord-tenant relationship remains solid by caring for the rental as you would a home that you personally owned. This means ensuring that the HVAC is not damaged because the filter was not changed regularly, or that pipes are prepped for winter cold. Having renters insurance is vital to protect your belongings and convey to your landlord that you are a responsible tenant. Renters insurance can even cover damages should you cause unintentional harm to the property or if your dog bites someone who decides to sue. Renters insurance is surprisingly inexpensive, and can even offer coverage on your valuables outside of the home. Just don’t forget, a policy is only as effective as your documentation. Be sure to take a complete inventory of your belongings in case you ever need to file a renters insurance claim. If you want a happy landlord, you must follow your lease agreement down to the “T”. Many renters will look at a lease agreement as a mere formality that consists only of general guidelines regarding the rental and its respective rules. However, ignoring the details of your lease terms will guarantee a rocky relationship with your landlord, and could result in additional fees or even eviction. Pay attention to small details in the lease like who is responsible for snow removal, the use of nails when decorating your apartment or if you are allowed to keep indoor plants. These rules may seem nitpicky, but your landlord likely has specific reasons for their implementation, and failure to follow those rules could result in security deposit deductions, fines or even eviction. The tenant that makes their landlord happy to have, is not the tenant that calls at all hours of the night and day to complain about menial issues. Altering your landlord to maintenance issues is important–and can even save your landlord some extra funds if prompt alerts prevent damage from getting worse. However, constantly requiring special attention will make your landlord weary of your tenancy. You’re better off resolving small matters on your own, change your own lightbulbs and deal with bad neighbors professionally on your own. Keep your complaints to a minimum and remember that you are not your landlord’s only priority, this will both keep your landlord happy and ensure that if you ever must make a complaint, it is taken more seriously.